If you're like me, you'll usually have a lot of buffers open in emacs. To quickly switch between them, you press C-x b (Ctrl-X and b), and type the beginning of buffer name. This is made much more convenient with e.g. ido (see Switching Buffers) or icicles. They allow you switch to a buffer by typing just some characters appearing anywhere in the buffer name, autocompletion etc. The question for today is: what to do if am not searching for a buffer or file, but for some emacs command? Often, I search for a certain command, ie. the ones that come after M-x. After typing M-x there's autocompletion if you know the beginning of the command… but maybe I remember only it was something with string, but exactly how? Was it replace-string or string-replace? For these deep problems, there is smex (think: search-M-x). smex brings ido-style completion to choosing commands. As you can see, I have set the keybinding to M-X, that is (for most people) Alt-Shift-x; of course you could override the normal M-x ('execute-extended-command', note the small x), but usually the normal completion is fine. Admittedly, smex serves a niche use-case, but I still use it a couple of times a day. It's sometimes nice to see the changes you've made to a file. If the file is under version control, you can use the 'diff'-features of the version control system of course; or you can use diff-buffer-with-file to compare your buffer with the version on disk. That obviously only. works when you haven't saved the file yet. Anyway, a bit easier, straighforward way may be to use highlight-changes-mode. 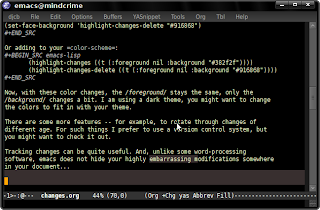 With that mode, emacs can give a special color to parts of the text that you have changed. The last line tells me that the changes should not be visible unless I want to see them. Another interesting thing you can do is M-x highlight-compare-with-file. Now, with these color changes, the foreground stays the same, only the background changes a bit. I am using a dark theme, you might want to change the colors to fit in with your theme. There are some more features - for example, to rotate through changes of different age. For such things I prefer to use a version control system, but you might want to check it out. Back to regexps - on of the issues with regexps in Elisp is that they need extra quoting, that is, lots of \-escape characters; regexps can be hard to comprehend, and this does not help… Why the extra quoting? Let's look at a simple example. Suppose we want to search for the word cat. And not category or concatenate. The regular expression would then be \bcat\b. In Perl you could write this as /\bcat\b\/ (in Perl you specify regexps by putting them between /-characters). Not so in Emacs-Lisp. On the Lisp-level, there are no regexps; there are only strings and only the regexp functions understand their true nature. But before the strings ever get those functions, the Lisp interpreter does what it does best: interpreting. And when it sees \b, it interprets it as the backspace-character. To make things even more interesting, in different contexts, different rules apply. The above is all about regexps in strings in Emacs-Lisp. However, things are different when you provide a string interactively. Suppose you search through your buffer (with M-x isearch-forward-regexp or C-M-s). Now, your input is not interpreted by the Lisp interpreter (after all, it's just user input). So, you're exempt from the slash tax, and you can use \bcat\b to match, well, \bcat\b. So, regexps can be hard, and Emacs-Lisp makes it somewhat harder. A natural way to come up with the regular expression you need, is to use trial-and-error, and this is exactly what isearch-forward-regexp and friends do. But what about the slash-taxed regexps that you need in your Lisp code? The answer is M-x re-builder. I am sure many people are already using it, but even if there were only one person that finds out about this through this blog-post, it'd be worth it! And this is the whole trick here: whenever you need a regexp in your code, put the kind of string it should match in a buffer, and enter M-x re-builder. re-builder will put some quotes in the minibuffer. You type your regexp there, and it will show the matches in the buffer as you type. It even supports different regex-syntaxes. By default, re-builder will help you with the strings-in-Emacs-lisp kind of regexps; this is called the read-syntax. But you can switch to the user-input regexps with C-c TAB string RET (yes, these are called string here). There are some other possible syntaxes as well. One final trick for re-builder is the subexpression mode, that you activate with C-c C-e (and leave with q). You can than see what subexpressions match (ie. if we can match cat, cut, cot etc., with \\bc\\(.\\)t\\b, and the subexpression would then contain the middle letter. re-builder automatically converts between the syntaxes it supports, so you could use 'string-mode' as well, bc\(.\)t\b. There is one problem - a bug? I am using Ubuntu 9.04, which follows the Freedesktop Trash Spec; it moves delete file in ~/.local/share/Trash, together with some metadata, so it can restore the file to their original location. However, emacs follows some older convention, ie. to move the file to ~/.Trash, and without any metadata. You can partially fix this by making ~/.Trash a symlink to ~/.local/share/Trash/files/, but of course that does not get you the metadata. A friend asked me how to retrieve your IP-number in emacs; he needs it to figure out in which of various networks he lives, to update proxy settings and the like. He had found a decade-old function get-ip-address on the internet, and thought (correctly!) that it can't be that hard. So, fortunately, it wasn't too hard to do it a bit better, esp. with all the improvements in emacs in the last ten years. "get the IP-address for device DEV (default: eth0)"
(substring  ;; chop the final "\n"
Now, calling (get-ip-address "eth0") or (get-ip-address "lo") in your scripts will get you the IP-number. Obviously, this only works on systems that have this ifconfig, and is also vulnerable to small changes in the output. Don't even ask about IPv6. The solution does give us a nice example of using shell-command-to-string, which is really useful function to integrate with all kinds of external tools; the difference with decade-old get=ip-address is striking. "Win32: get the IP-address of the first network interface"
The Windows version does not support choosing the interface; I'll leave that as an excercise to a reader with some more Win-fu; that same reader might also have a solution that does not involve ipconfig, but uses some Win32-API. And of course, that user is invited to help the emacs development team to add a Win32 version of network-interface-info. to your .emacs will make emacs remember where you were in a file, the last time you opened ('visited') it; when you re-open it, it jumps right back to where you were. The set-default enables saveplace (which is buffer-local) for all buffers. There are some more customizations possible, but they seem less useful to me. SavePlace is the kind of nice convenience that make emacs so nice… at the same time, it shows that so many of these small conveniences can go unnoticed for years (saveplace has been part of Emacs since version 19.19 of 1993!). I am back from my little holiday, fully re-energized etc. ; Before I went, I asked Emacs-Fu-readers to share their favorite .emacs-tricks; and I was very pleasantly surprise with so many excellent tricks, many of which I did not know about. Thanks!! So, in some future entries I´ll go through the ones I found particularly interesting – however, look for yourself through all these nice tips. Of course, I won't simply copy what you could already read, – I'm not that lazy – but instead, I'll try to give a bit of extra background, and try to make these tips even more useful. The first great new trick mentioned in the dot-emacs trickery-post was savehist-mode (thanks Valvo). With savehist-mode, you can save your minibuffer history (ie. the commands you gave). It's the simple alternative to more complex session-saving mechanisms like desktop-save-mode and (many!) friends. As shown, you should do the customizations before enabling savehist-mode, or they will be ignored. The savehist-additional-variables customization particularly interesting; you can put any (printable) variable in the list, ie. you could put kill-ring in there, to retrieve your old kill ring (the clipboard) when you restart emacs again. Note: if you want emacs to remember your recently-used files between sessions, you can take a look at recentf. Also, note that I am setting savehist-file to ~/.emacs.d/savehist. In general, I'll try to put all my emacs files there, instead of in my home-directory. This makes it a bit easier to back up things and keep my ~/ clean. For historical reasons, I still have my ~/.emacs, but I could use ~/.emacs.d/init.el instead (great tip by Steve Purcell).